Six German states have been told to pull some 73,000 eggs from sale after residue was detected from an insecticide called fipronil. Agriculture officials in Lower Saxony said the eggs had come from an organic farm in the Netherlands and insisted there was no risk to human health. Fipronil gets rid of lice but the EU bans it on animals such as chickens. 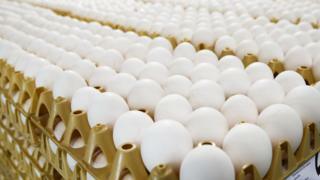 Last year millions of eggs were pulled from supermarket shelves across Europe because of a fipronil scare. Officials said they had now detected traces of the insecticide in samples from a packaging depot in the German town of Vechta. The residue was above the permitted EU level of 0.005mg per kg, but it was “well below a rate that would constitute a risk to health”, they said (in German). The highest test showed a level of 0.019mg/kg. The eggs came from an organic hen farm and were delivered between 17 May and 4 June. The source of the latest discovery is still being investigated. A second round of tests has been conducted and the results are expected later this week. The Dutch poultry industry was hit hard by last year’s insecticide crisis, when millions of eggs had to be removed from sale. Ten farms closed at the time have yet to reopen. Dutch food and consumer safety authority NVWA said it was monitoring whether the detection of fipronil had anything to do with the recent lifting of measures imposed amid fears of bird flu requiring farmers to keep free-range hens indoors. Reports suggested that the insecticide may have originated in contaminated soil at the poultry farm in question. “This is not a renewed use of fipronil in stables of poultry farms. It certainly does sound like a residue issue. Barns may have been flushed out,” NVWA spokesman Rob Hageman told the BBC. “It puts Dutch eggs in a bad light again,” said poultry farmers association president Eric Hubers. Germany is the biggest market for Dutch eggs.